Last month, Infusionsoft hosted a Mastermind call about building a dynamic checkout process which started me thinking about how to implement such a feature for a client. By the way, if you are an Infusionsoft user and you are not attending the weekly Mastermind calls, you are really missing out. I have been well impressed with the topics they cover. In the Mastermind Demonstration, which you can view at the Mastermind Archive, Corey Harding of Infusionsoft builds a dynamic checkout process using an Infusionsoft web form and an Infusionsoft product bundle link. What is the Infusionsoft Product Bundle Link? Through a product bundle link, Infusionsoft provides a mechanism to add multiple products to the shopping cart in one click. Once I saw what Corey did, I was sorry I did not think of it myself. It works especially well with Gravity Forms for a product that includes many options. Let’s say for demonstration purposes, I am selling a plugin. Along with the plugin, I offer an eBook that explains some of the nuances of the plugin and how to make the most of your purchase. I also offer installation of the plugin and an annual premium support plan. If the customer purchases 2 years of support in advance, I offer a 50% discount. I used Gravity Forms’ Product Pricing Fields to configure the form. The top field is a Single Product field with the quantity disabled (because this is presumed to be a digital product – there is no need for quantity). The installation, ebook and support fields also use a Product Pricing Field with Radio Buttons field type. I included a hidden field on the form that contains a promo code for the multi-year support discount. This hidden field is unnecessary as you can configure purchase discounts in Infusionsoft that do not require a promo code but I included it anyway for this example. Lastly, I dragged in a Total Pricing Field so that the customer could see how much the purchase was going to be before adding it to their cart. If the above was submitted, 1001 units of product id 35 would be added to the shopping cart. This, of course, is not what we want. Like everything in life and especially online, there are many ways to accomplish any one task. 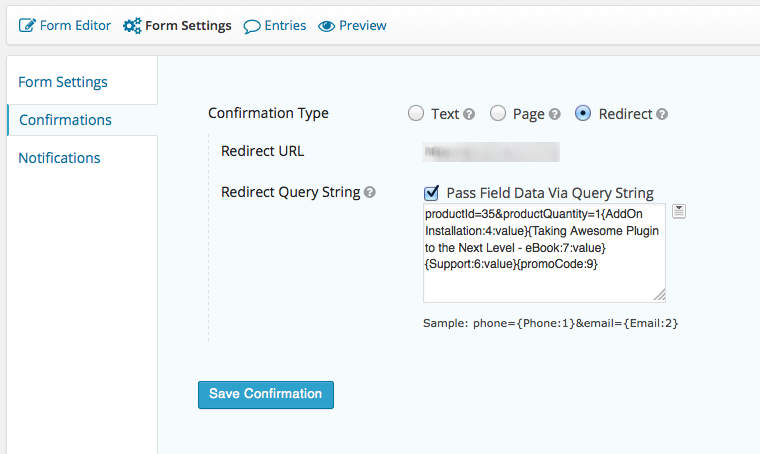 Using an Infusionsoft webform to create a dynamic product bundle is possible and requires no additional tools. But if you are already using Gravity Forms, and want to create a more pleasant customer experience why not put the process together using Gravity Forms?